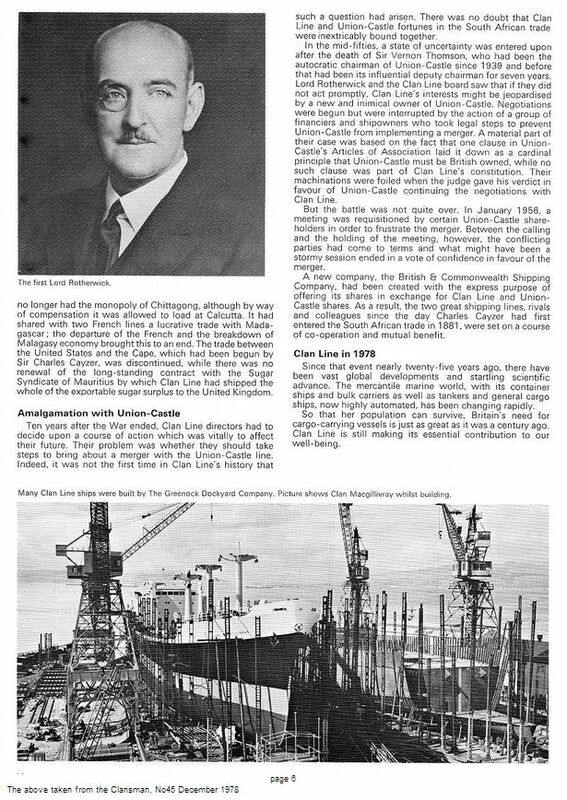 The company that would become the Clan Line was first founded as C. W. Cayzer & Company in Liverpool in 1877 by Charles Cayzer (see Cayzer baronets). It was set up to operate passenger routes between Britain and Bombay, India via the Suez Canal. 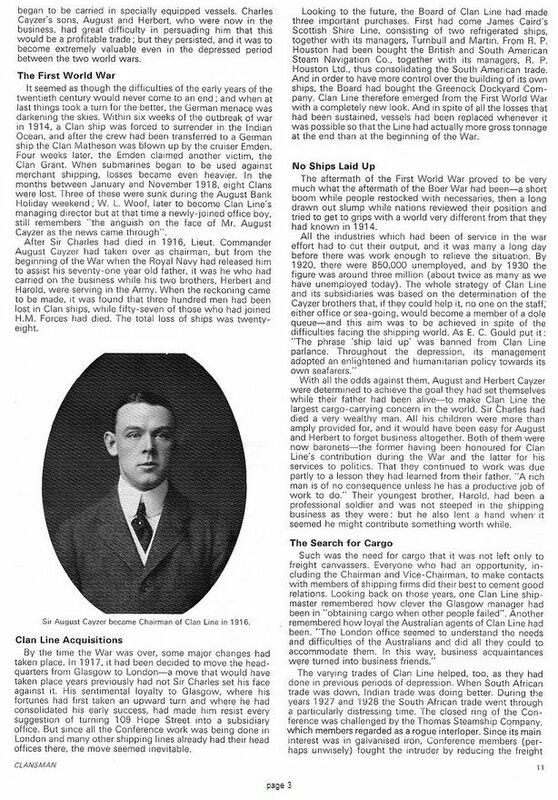 The next year, Captain William Irvine joined the company and it was renamed Cayzer, Irvine & Company. 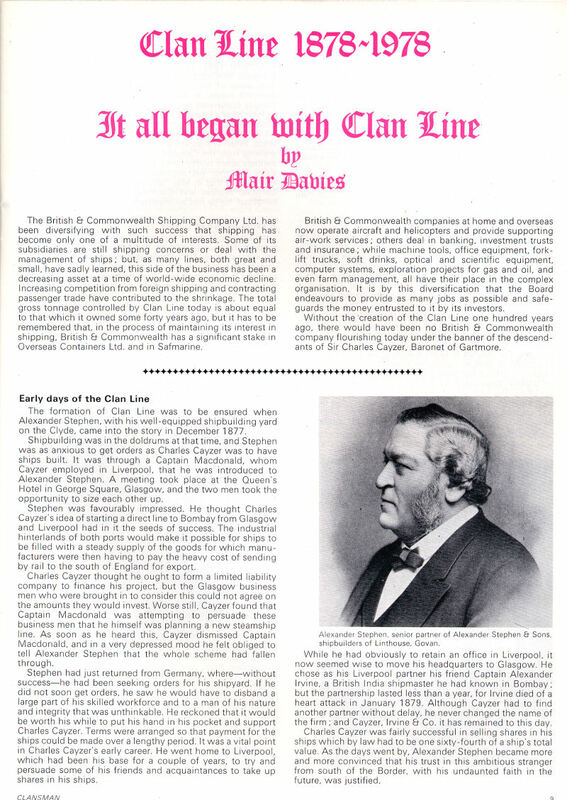 In 1881 the company was joined by an influential Glasgow businessman, and the Clan Line Association of Steamers was established. The company opened a new head office at 109 Hope Street, Glasgow. 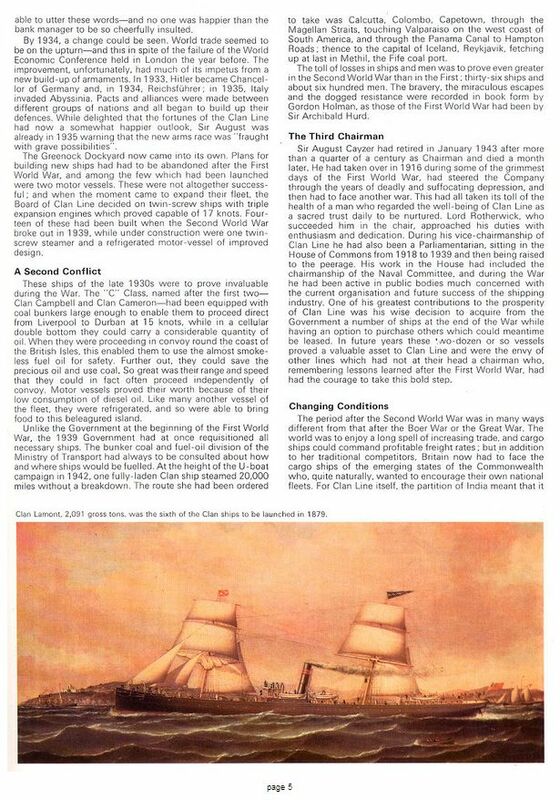 Cayzer Irvine built and managed ships for the association and Cayzer himself retained ownership of the original six Clan ships. At the same time, they expanded their operations to South Africa. 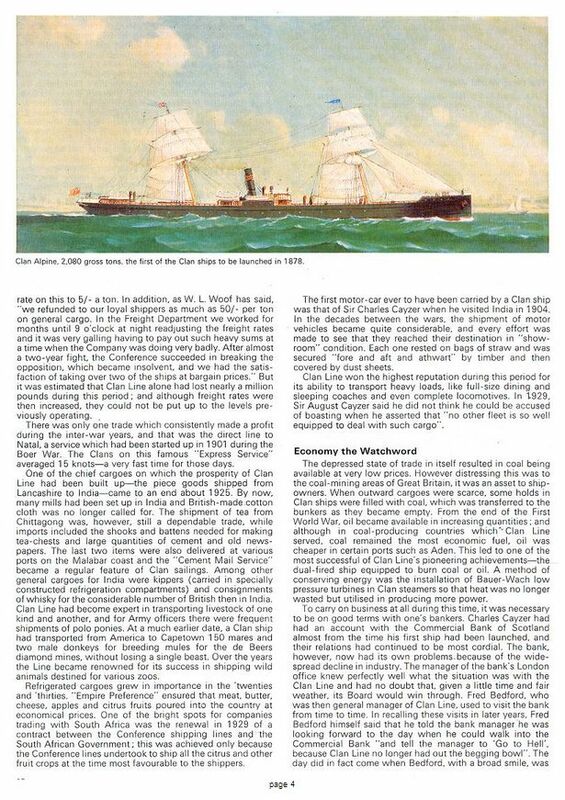 In 1890 the company became The Clan Line of Steamers Limited with Cayzer holding the majority interest. The company again expanded its operations with the purchase of the Persian Gulf Steam Ship Company in 1894, bringing four more ships into the company. They used these new assets to expand their routes into the Persian Gulf and to North America, and to begin to carry cargo. The company was incorporated in 1907 as Cayzer, Irvine & Company, Limited, with the Cayzer family retaining control. 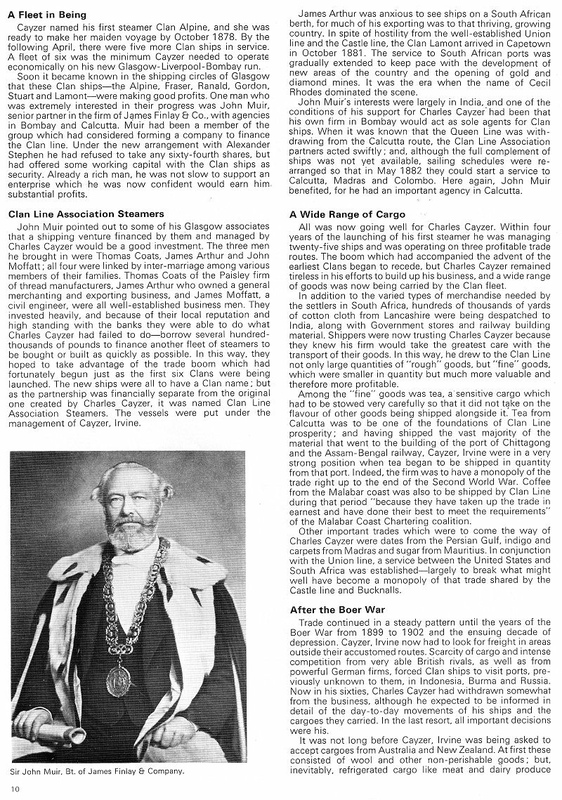 Charles Cayzer died in 1916, with his sons continuing to run the company. In 1918 they acquired and incorporated the assets of the Scottish Shire Line. Despite suffering losses in the First World War, the company had recovered by the 1930's to become the largest cargo carrying concern in the world. Glasgow - Liverpool / Birkenhead - Suez - Bombay / Calcutta. Glasgow - Birkenhead - South Africa and later East Africa. This became a round Africa service. South Africa - New York. UK - South Africa - India - Australia. Mexico and then UK - Great Lakes.